Even though it’s similar to one you might have seen last year, this cosplay will still be hard to top. That’s right, here’s another Hunter x Hunter Gon cosplay. 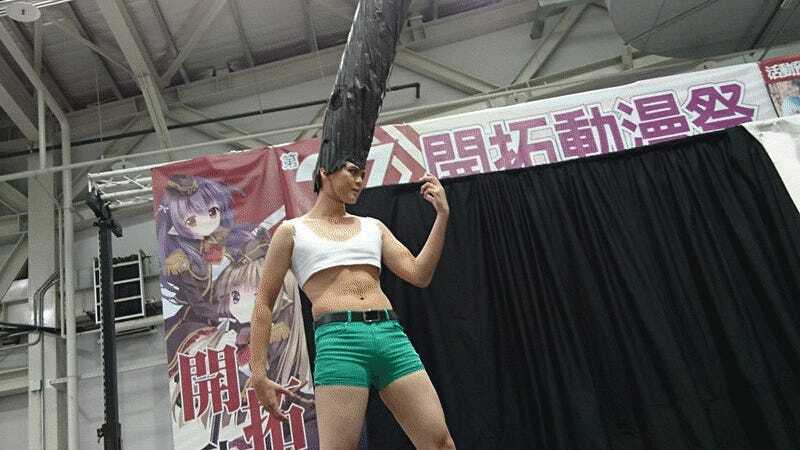 This cosplay depicts Gon after he transformed into an older version of himself, and it appeared at this year’s Fancy Frontier manga and anime events in Taiwan. The hair is so high, it seems to touch the ceiling. There’s also a silly Hunter X Hunter statue, which seems to have inspired these recent costumes. It looks like there is some kind of contraption blowing air into the faux hair, kind of like a wind sock. This article was originally published on February 3, 2016. It has been updated with new photos from this weekend.